Light within the Shade is an ambitious project. 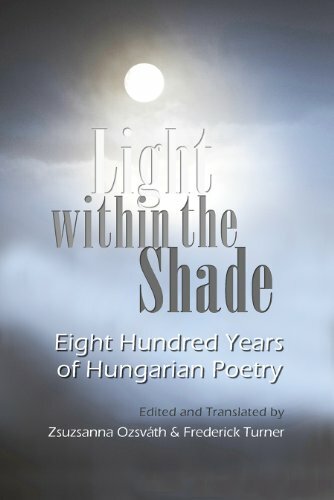 Not only does this volume contain selections from 800 years of Hungarian poetry, it also features two lengthy essays, The Power of Poetry in the Hungarian Literary Tradition by Zsuzsanna Ozsváth and The “Thou” of Hungarian Poetry by Frederick Turner—all packed into 278 pages. This represents a seminal feat of organization and planning which is on the whole surprisingly successful, although the book’s concluding essays would have proven more effective had they been placed in the beginning of the volume to provide grounding for the reader. Hungarian tribes in the Carpathian Basin adopted Christianity early in the 11th century. The Latin language was introduced at that time for liturgical and some literary usages. In the 13th century, Mongolian Tartars invaded Hungary; they were driven out within a year, but the invasion proved devastating. A long, unsettled period of dynastic disputes and wars ensued. Ottoman Turks invaded in the 16th century and stayed on to control portions of Hungary for 150 years. The Austrians finally drove out the Turks in the latter part of the 17th century whereupon the Austrians began to exert control over Hungary. Hungary staged a failed revolution against Austria in 1848–1849. In 1867, a compromise resulted in the establishment of the Austro-Hungarian monarchy which was dissolved after Germany and Austro-Hungary were defeated in World War I. World War II saw Hungary once again allied with Germany and Austria. During the 1944 German occupation of Hungary, almost 440,000 Hungarian Jews were transported to Auschwitz and other German death camps. After the Axis defeat, the USSR occupied Hungary. Despite the short-lived and unsuccessful Hungarian revolution of 1956, Hungary remained in the Soviet sphere until the 1991 dissolution of the USSR. Given this history, it is no surprise that many of the poems featured in Light within the Shade focus on war, invasion, and violence. The serious role that political developments played in Hungarian literature cannot be overemphasized. The poems in this collection appear in more or less chronological order and each poem is dated, which is helpful. Biographical statements associated with each poet’s work would have been beneficial placed at the beginning of each set of poems. The poems have been translated collaboratively. Ms. Ozsváth has provided the literal translation of each piece while Mr. Turner has created metrics, rhyme schemes, and free-verse cadences duplicating wherever possible the character of the original poems. The majority of the poems in the book are well presented and memorable, and the collection, while not totally seamless, is certainly powerful and effective. The book opens with a brief selection of anonymous songs followed by poems by the poet, Bálint Balassi (1554–1594) who was killed in the line of duty during the 15 Years’ War. He wrote tongue-in–cheek chivalric love poems as well as rousing poems of battle. Despite the pogroms, invasions and revolutions, despite the blood that has been spilled through centuries of cold summers and false springs, the beleaguered poets of Hungary continue to write, the ground-glass dust of European history refracting in poem after poem. This volume is a courageous contribution to a world view of poetry and to poetic possibility.